The field of disaster risk management aims to establish human security engineering as a part of implementation science by building an integrated and interdisciplinary framework for the strategic management of policies for disaster prevention and recovery in Asian Megacities. 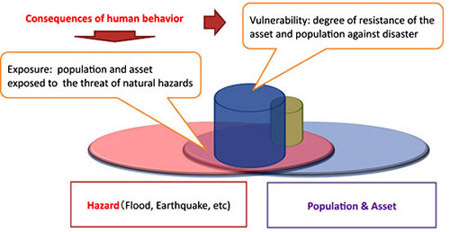 A disaster occurs when the spatial distribution of a natural hazard, such as an earthquake or a flood, overlaps with that of a population and assets (Fig.1). In recent years, human casualties and economic losses caused by natural disasters in Asia have been increasing, indicating that the population and economic assets of the area are becoming concentrated in disaster-prone areas. To form a city that is more resilient against disasters, it is necessary to establish an integrated disaster risk management policy. 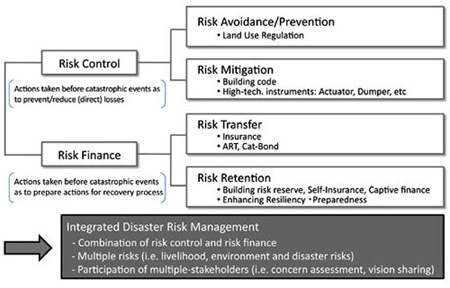 The integration of risk management procedures is therefore an important concept when addressing disaster risk management policy for Asian Megacities (Fig.2). How to integrate our knowledge and wisdom in a practical and adaptive form, share it and bring it to fruition it in the context of ongoing urban development is an important research problem. The biggest aims and issues in this field of research are the application to real issues of knowledge accumulated by researchers over the years, the establishment of a methodology to fill the gap between knowledge and practice, and the promotion and development of research that is oriented towards solving problems. In the field of disaster risk management, we develop implementable techniques to reduce disaster risks and plan integrated disaster risk management, focusing on cities such as Mumbai (India), Hanoi (Vietnam), Shanghai and Guangzhou (China), and Kuala Lumpur and Johor Bahru (Malaysia).